SEASONAL: I’m uncertain, check with management. It would be the summer months they close due to the hot climate. RESERVATIONS ACCEPTED: Maybe, but when I called to make one I was told to just drive in. GPS: N 33.76015, W 113.65362. This marks the turnoff from route 60. A large sign marks the RV park which is right at the turnoff. The sign is not well illuminated after dark. MAXIMUM RIG SIZE: They had quite a few good size 5th wheels and Class A rigs here, so I think they can handle most all rigs.. HOOKUPS: Yes, 30/20 amp, water and sewer. 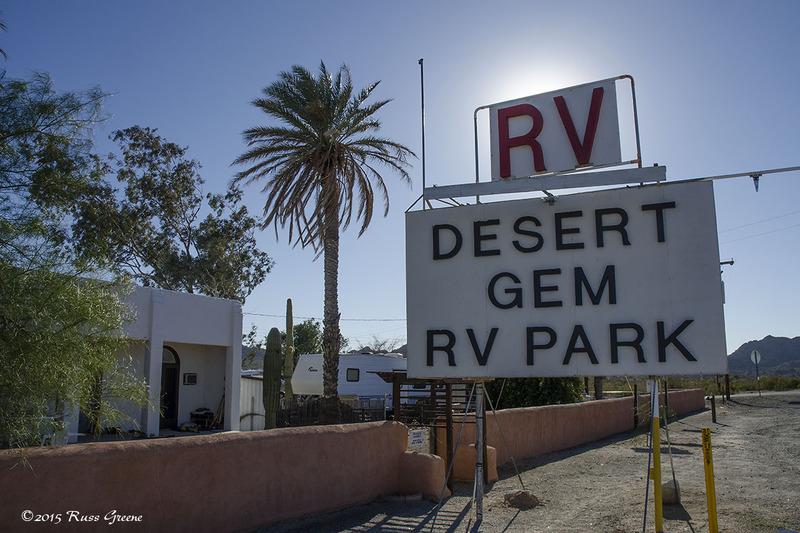 It’s hard to miss the sign for Desert Gem RV Park. I don’t know if it is illuminated at night, however. WiFi: Yes, $1 per day, $4 per week, bandwidth monitored for the first device. A message appears when you sign on that your data speeds may be throttled if you consume too much data. Really? How much data can you consume at the available speeds (see below)? I saw download speeds about 1 Mbps faster on my laptop. RESTROOM RATING: Pass (I assign a Pass or Fail rating based on many considerations including: cleanliness, usability, hot water availability, hand soap availability, ease or difficulty it is to use the toilet paper, condition of fixtures, if using the restroom is a pleasant or unpleasant experience, etc.) although the men’s room was very dated it was clean and there was hot water and hand soap. Nothing to complain about here. SHOWER RATING: Pass (I evaluate showers in a similar fashion to restrooms. See above.) The showers are large and were clean, home style, stall showers. Water temperature was adjustable and plenty hot. The knobs can be inadvertently bumped while showering due to their placement and I nearly scalded myself when I bumped one of them. Gas: There’s a Shell Station a few miles up the road. Dump: Sewer hookups at sites. SaniDumps indicates the Desert Palms Golf and RV Resort nearby has a dump station. Groceries: Family Dollar a few miles east on 60. 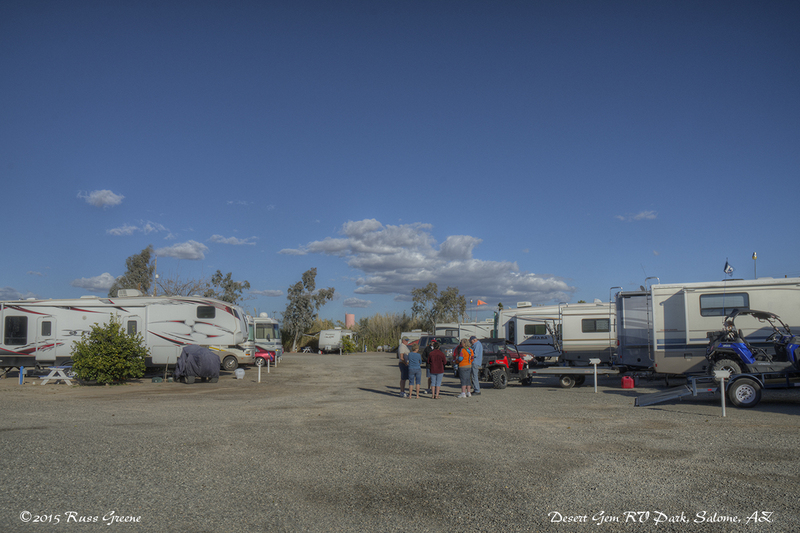 A group of campers chat at Desert Gem RV Park, Salome, AZ. There’s not much around here. My first impression of this campground was a little less than favorable but the place grew on me. First the owner wasn’t all that welcoming. She wasn’t impolite in any way, but she wasn’t all that friendly–all business. Often, campgrounds will give you a handout with a campground brochure or map telling you where the campsites, restrooms, showers, can be found and what their hours of operation are, rules and regulations, etc. None of that here, so I was perhaps a little thrown off, but it turns out none of that is necessary: the place is small enough that everything is easy to find. WiFi, claimed online to be good, costs $1.00 extra, and isn’t all that good (see measured speeds above). Plus, the code given to me was for one device. I asked for a second password for another device and was not charged extra. Office hours are irregular, but the owners live on premises so I’m assuming they can be reached if needed even when out of the office. There is a bell to ring outside the office door when it’s locked. The campground is right along route 60 so there’s traffic noise from the road. It’s a secondary highway with but one lane in each direction and periods of time when no traffic is audible. At night auto traffic was pretty quiet. The campground is across the street from freight train tracks. I was told maybe 4 or 5 trains come through a day, but I didn’t notice any from the time I pulled into Desert Gem at maybe one in the afternoon through the time that I penned this paragraph at about 7:30 P.M. 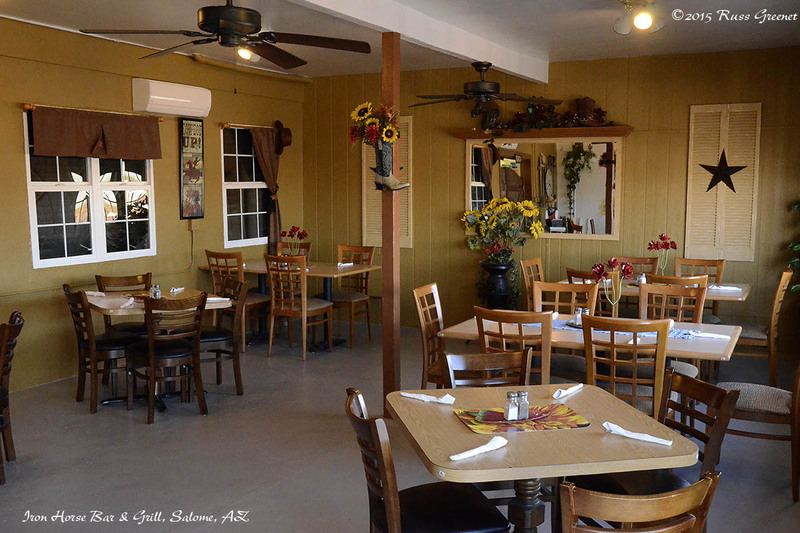 This is the dining room at the Iron Horse Bar & Grill in Salome, AZ. The campground itself is a gravel lot, like so many other independent, commercial campgrounds. Sites are close to each other. This was a one night stopover for me so I didn’t investigate things to do in the area but the name of a nearby RV park implies there is golf. There are some nice views of the surrounding mountains from within the park and just outside of it. There is a covered, walled-in picnic area with a microwave. If it works or not I don’t know. For me, this park fit the bill of giving me a launch pad close to Quartzsite, AZ, maybe 35 miles away where I wanted to arrive early the next morning, and with Passport America the price was certainly right. 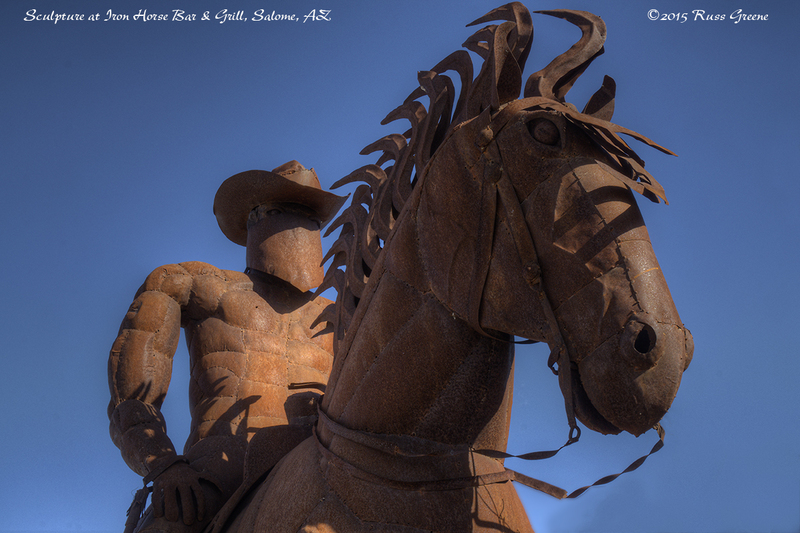 This photo has little to do with Desert Gem RV Park. 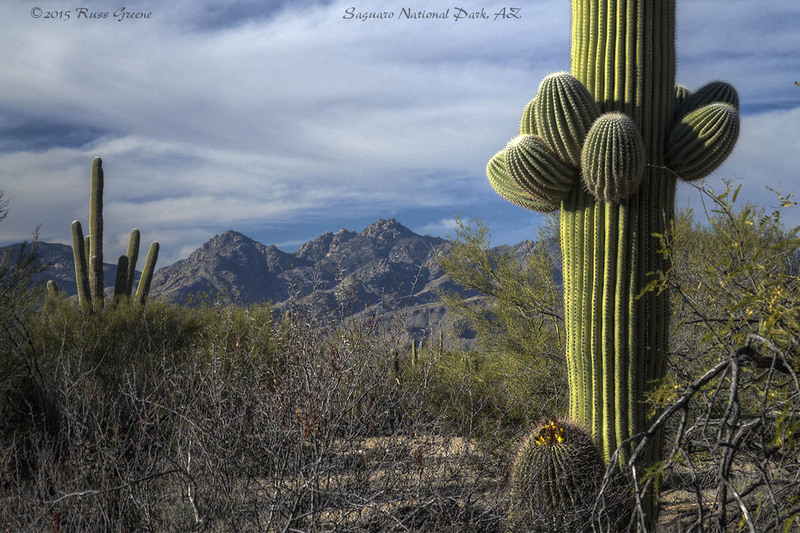 Yes, there may be a few saguaro cacti in the neighborhood but nothing like Saguaro National Park where I took this shot. I’m including the photo here because the area has a similar feel, and because I like the shot. Hi – well, we don’t know exactly when we’ll be in Arizona. We’re trying to leave Portland, Oregon around Aug 1st or there about. We’ll meander toward Tonto Basin/Roosevelt Lake – Where was the boondocking spot near Grand Canyon – on BLM land? It’s cold and rainy in Portland today….want to get out of the rain!!!! Just messing with you. I value your posts and maybe we’ll meet you one day “out there”. We’re shooting for an Aug 1st departure date and heading toward Arizona. Where and when in AZ? I was there at the beginning of my trip and boondocked near the Grand Canyon in a lovely spot in the National Forest. I’m in AZ again now, of course. It’s 87º here today and I’m lovin’ it. We’ll be sure to ring the bell if we find the door is licked! Thanks for your review. There a wiseguy in every audience! LOL. You should also ring it if the door is locked. We’ve driven through Salome a couple of times and could never find a reason to stop LOL. There are quite a few RV parks in the area. I was surprised. There isn’t much else. I passed a number heading west along 60 toward I-10 and Quartzsite, and they were far from empty. I think there are a lot of snowbirders that come down for the warmer weather and it may cost less around Salome than more metropolitan areas.